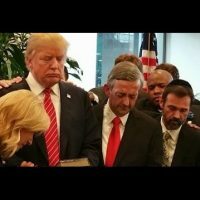 Pastrix Paula White, Pastor Robert Jeffress and other religious leaders praying for then presidential GOP candidate Donald Trump. Recently there has been discussion about the term “evangelical.” What does it mean? Who are evangelicals? How do we know? It’s a good thing because clarity on truth is a good thing. If anyone would speak accurately of the Christian evangel, they must do so from the source of the evangel; the Bible. We could reference many passages, but if I were to choose one, it would be 1 Corinthians 1:18-31 . To be sure, the passage was not written to 21st century Westerners in order to recalibrate flawed definitions of “evangelical.” However, it was written to pleasure-loving, professing Christians living in a worldly culture, to recalibrate their understanding of the evangel, or the gospel of Jesus Christ. The writer of 1 Corinthians was the most evangelical evangelical in Christianity; the apostle Paul. He wrote this section of Scripture to teach a correct theological and philosophical understanding of the Christian gospel. In doing so, he zeros in on the centerpiece of the gospel, the cross of Jesus Christ. The cross refers less to the wooden object and more to the meaning and implications of what God did through the cross.